Greetings, Audionauts! Captain Radio here with a review of The Realm Unseen from StoryLine Studios. Eventually, you, the blind protagonist discover the outrageous yet plausible reason for your blindness. When you turn to the mysterious Dr. Griffin to help recover your sight, you also encounter your dark adversary, Cassius, who wants to step in line ahead of you. The day then is spent entangled in dread, danger, and potential doom at every turn as you pray to stay a step ahead of Cassius, to avoid numerous horrid mishaps, and to race on to your final destination, one of London’s most eclectic landmarks. Even without the adversarial motif, audio participants might experience vicarious terror enough imagining their plight without sight. Attempts to characterize this unique collaboration among scriptwriter, J.S. Earls, Narrator and co-developer, Josh Armstrong, and sound engineer/original score composer, Kevin Patterson, can rapidly degenerate into blind philosophers debating the essence of elephant. Though clearly not a Duke Nukem ™ leveled shoot-‘em-up, this media creature is too interactive and too richly labyrinthine to be considered a forthright audio book. Given the size of the creative team, the vividly sensory mood of the production, and Earls’ recognized skill at writing independent comics, perhaps Realm would best be distinguished as an interactive audio novel. Ironically, these blind alley misfortunes give the plot surprising staying power. Whether from among the intended audience of adult audio book devotees or from among middle-schoolers who, surprisingly, latched on to Realm during Earls appearances at comic bookstores or cons, participant listeners quickly and keenly engage in ferreting out the single successful outcome. Since completing The Realm Unseen, Earls has hatched many story ideas he hopes eventually leads to an even longer and denser sequel. However, he wants to hear more his audience’s experience with the original, so he invites The Realm Unseen participants to email him at [email protected]. Experience yourself the heart-pounding terror and excitement of The Realm Unseen by acquiring this unique interactive audio experience from http://springbrookaudio.com or from larger resellers, such as Amazon. 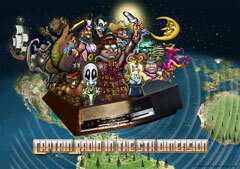 Until next time, Audionauts, this is Captain Radio, signing off! Captain Radio Reviews The Realm Unseen from StoryLine Studios!